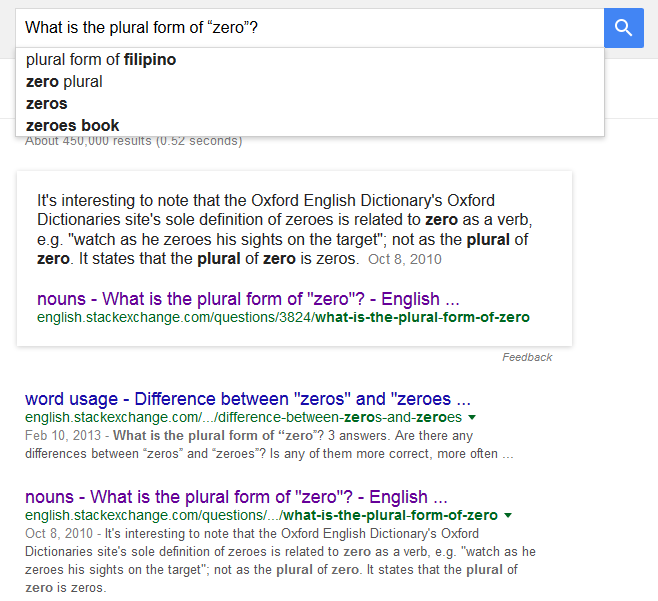 What is the plural form of “zero”? I tried looking on Google, but there are some fairly contradictory results. I thought I'd ask you guys so we could get an authoritative answer on the subject! Both zeros and zeroes are acceptable, see e.g. Merriam-Webster, Wiktionary or TheFreeDictionary. So in practice zeros is preferred in the US and even more so in the UK, though citations for zeroes include such prominent examples as Stephen Hawking's Brief History of Time. (Mr Hawking is British, but the book was first published by an American publishing house.) The oldest citation for zeroes in the BNC is from 1978. The Corpus of Historical American English has six citations that are even older, the oldest one being from 1914. Note that dictionaries document the (current, at the time of going to press) usage of language, they aren't authoritative. 'Correct' is what is in common usage and largely understood to be correct, even if that contradicts a dictionary (in which case the dictionary is probably out-of-date). It's interesting to note that the Oxford English Dictionary's Oxford Dictionaries site's sole definition of zeroes is related to zero as a verb, e.g. "watch as he zeroes his sights on the target"; not as the plural of zero. It states that the plural of zero is zeros. This doesn't mean that using zeroes as a plural is wrong, as I've already said, it just shows that such usage is probably a more recent occurrence, gaining acceptance as the use of zero as a verb falls into decline. As Barrie England helpfully points out in a comment (thanks Barrie! ), the link above isn't to the OED, as I'd initially specified, and the OED quotes zeroes as the only plural of zero. Both sites are run by Oxford Press, the former providing data from a collection of Oxford Press dictionaries. I think the difference between the two emphasizes my point that there is no 'correct', and that dictionaries merely document popular usage. I imagine there are more resources dedicated to the OED and that this is more likely to be up-to-date, but really that's just speculation. I prefer "zeroes" because "zeros" resembles the Greek singular and seems to invoke the pronunciation ZEH-ross, and I'm not the only one. Oxford explains their pluralization rules including an appearance of zeros, here: Oxford Dictionaries: Plurals of Nouns. Usually add -s (solos, zeros). If vowel+o, add -s (studios, zoos). Some words take -oes (buffaloes, dominoes). Other words can take -os or -oes (banjos/banjoes, cargos/cargoes). At this point I am beginning to sympathize with Dan Quayle and his potatoe incident! Not the answer you're looking for? Browse other questions tagged nouns grammatical-number orthography vowels silent-letters or ask your own question. Should nouns borrowed from Japanese be pluralized? What is the longest word you can come up with that the letters are all in alphabetical order? What is the plural of “ostrich”? What is the plural of “chewing gum”? What is the origin of the term “ginger” for red-headed people? Was analysis spelt as anlysis in the past? What is a meaning of suffix “nip” in “Catnip”?